Missing teeth can cause a wide range of issues, making simple things like eating, speaking, and smiling feel difficult, awkward, and even painful. However, rather than focusing on the problem, Dr. Martinez is ready to offer his patients solutions in the form of custom-made restorations. 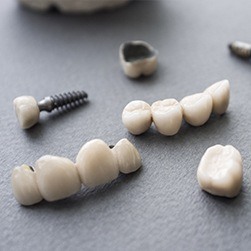 Whether you’re missing a single tooth or are in need of a full denture, he can help you regain your bite and your confidence at the same time using the options listed below. If you’re ready to have a complete smile again, he’s ready to give it to you, so contact us today. Why Choose Glow Family Dental to Replace Missing Teeth? Like all dental problems, tooth loss only tends to lead to even more issues if left untreated. The remaining teeth will naturally want to drift into the open spaces in the mouth, causing the teeth and bite to misalign as a result. Patients with missing teeth are also much more likely to develop gum disease, which in itself is the leading cause of adult tooth loss in the US! These problems are all on top of the functional and aesthetic issues gaps in the smile can cause, but fortunately, they can all be prevented simply by replacing the teeth as promptly as possible. A dental bridge is a type of prosthetic that literally “bridges” the gap left by one or more missing teeth in a row. Two crowns are placed on the teeth on either side of the missing ones, and these are used to support the replacement teeth. With a bridge, we can restore balance to the bite, stop the surrounding teeth from shifting out of place, and help a patient regain their normal appearance at the same time. For hundreds of years, dentures have provided an effective and affordable solution for patients missing a large number of teeth. 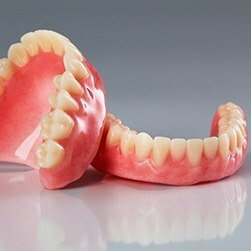 Now, modern-day dentures are more comfortable, natural-looking, and durable than anything your parents or grandparents might have worn. Based on a patient’s unique needs, we can design a custom-made prosthetic that replaces multiple teeth along a single arch (partial denture) or one that can bring back an entire row at once (full denture). There are many different options, and you can learn more by clicking on the link below. 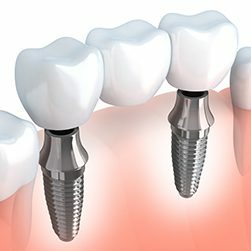 When it comes to replacing any number of missing teeth, there is only one treatment that dentists around the world consider to be the best, and that’s dental implants. They are the only treatment that replaces an entire tooth both above and below the gum line, creating a final result that is the next best thing to nature. Implants not only look great and are extremely strong, but they’re durable as well, as one can easily last for 30 years or more.